Repurpose your mason jars with one of these 50 DIY projects. From practical uses to beautiful home decor ideas, you're sure to find at least one project that you'll love. A little spray paint goes a long way into transforming these plain glass jars into watermelon glasses. Perfect for summer fun, use these to sip on a cocktail, corral utensils for seasonal entertaining, or hold party favors. Macrame is so trendy right now and what better way to use it than for a plant hanger! Add a mason jar, and you've got the perfect (not to mention easy) DIY to spruce up your space. Keep the bugs away on cool summer evenings with DIY citronella candles. This easy tutorial will you show you how to make stylish alternatives to the not-so-pretty store-bought ones. It's happened to all of us: We spend the time making cupcakes for someone's birthday or a special occasion only to have our energies wasted when they get smashed or ruined during the transporting process. This useful DIY is sure to keep your cupcake safe upon delivery! Kids will especially adore this project. This DIY glow in the dark jar looks like a jar filled with fireflies. Use them as decor for your nighttime outdoor parties in the summer. Turn small mason jars into chocolate-scented candles to light in your home, or to give away as party favors. Make your custom table lamp by repurposing a mason jar as the base of the lamp. For the perfect party favor for adults, create these cocktail gift sets. Fill a mason jar with a canned drink and attach a bottle of alcohol to the jar, along with a stirrer. You can create multiple drink combinations for different tastes. This DIY pineapple luminary jar would be perfect whimsical decor for a kid or teen's room, or for extra lighting on the patio. For an inexpensive gift idea, make a jar of brownie mix. Layer all the dry ingredients in a mason jar and attach the recipe to the exterior of the jar. Replace your old kitchen soap dispenser with a stylish milk glass soap dispenser. You can make your own using a mason jar, a soap pump, and some paint. Repurpose a mason jar to create a small sewing kit. Fill it with all the essentials you would need to fix a small tear or broken button. Top it off with a pin cushion! Hang a string of handmade lights across your patio with this amazing DIY project. Enhance your tablescape with a set of brightly colored ​candleholders. For a rainy day activity, your kids can create their own "piggy" banks out of mason jars. This project allows them to personalize the jars to resemble their favorite superheroes. This DIY silverware holder is perfect for outdoor entertaining. Place all your forks, spoons and knives in mason jars before transporting your silverware outside–this holder will help you save time the next time you need to bring all your dishware to your outdoor dining area. Add some sparkle to your home's decor with these lovely DIY glitter vases. Replace the light fixture over your dining table with a handmade rustic pendant light. This innovative mason jar chandelier is perfect for those who love farmhouse style. Children are sure to love making these emoji containers for their rooms. For the perfect afternoon activity, provide them with a small mason jar and some paint so they can recreate their favorite emoji. Decorate a mason jar with gold polka dots for the perfect party glasses. Add some soft diffused light to your home with these DIY frosted candle holders. Spoil your dog with a jar full of his favorite treats. Add flowers to your home in an unexpected way with this clever DIY project. These cute mason jars painted with fruit designs are perfect for your next summer BBQ. Prevent your twine from becoming knotted with this DIY storage jar and organizer. These chic DIY storage jars are perfect for your bathroom, your dresser or your vanity. For an easy centerpiece at a holiday or special occasion dinner, paint a bunch of mason jars and group them together. Add flowers to some and utensils in others for a functional and beautiful centerpiece. Treat yourself to a spa day with a jar of margarita body scrub that will leave your skin feeling super soft. Repurpose an old plastic toy into a decorative top for a mason jar. The completed jar is perfect to store candies, small knick knacks or office supplies within. At the end of the year, reflect on all that has happened and all that you've achieved with a memory jar. Write down memories on pieces of paper and place them in the jar to store them until the end of the next year, when you can go back and add new memories from the previous year and read your old ones. Craft a pedicure jar with everything you need to pamper yourself. The completed pedicure jar is perfect to toss into a suitcase when traveling or to give as a gift to a friend. Keep all your first aid supplies together with a first aid jar. You can make your own by decorating a jar and filling it with essential first aid supplies, such as band-aids. Treat yourself to a delicious cup of cold brew coffee at home with this DIY mason jar brewer. Learn how to make your own candles by with this simple DIY tutorial. Create a custom snow globe this winter with this magical DIY. Add some edgy flair to your home's decor with a DIY skull luminary that would look fabulous on your coffee table. Not into skulls? Save these for around Halloween time! DIY Skull Luminary Tutorial from Earnest Home Co.
For a beautiful way to store drinking straws on your bar cart, try these glitter polka dot jars. This tutorial offers another way to keep your bathroom tidy with a set of mason jar holders. For a fun favor at a kids' party, fill some small mason jars with bubble solution so the party guests can blow bubbles. For a simple enhancement to an ordinary jar, decorate the tops of your mason jars with custom letterpress foil tops. Countdown to Christmas with this creative DIY advent calendar. 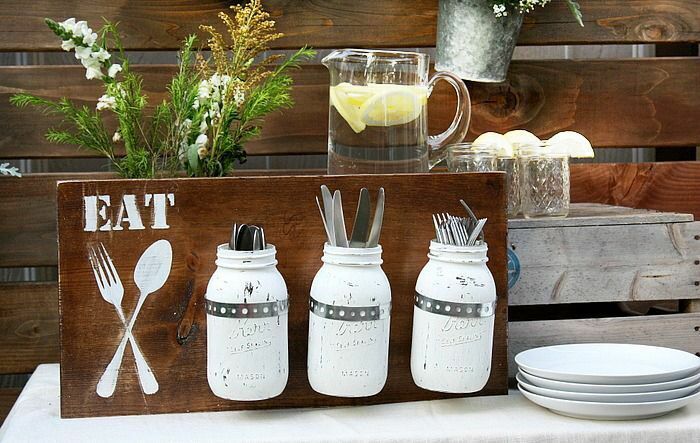 This DIY utensils holder is perfect for a BBQ, as guests can help themselves to cutlery. For pretty storage containers, follow this tutorial to add glitter to ordinary jars. Store kitchen essentials like flour and sugar with these DIY storage jars.